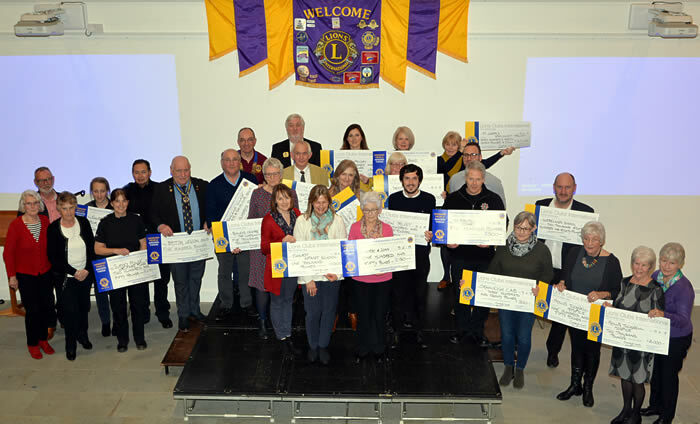 Over 100 people representing local charities, youth groups & schools, attended the Lions presentation evening on 19th February to receive cheques from the proceeds of last year’s Classic Car Show, Bonfire and Fireworks events. Recipients from the bonfire fund were; Slinfold Concert Band, the Police Welfare fund, Darby & Joan club, British Legion, Firefighters Charity, Cranleigh Scouts and CVSSC. Recipients from the Car Show fund were Phyllis Tuckwell, Park Mead Primary School, Rowleys Centre for the Community, Meath Epilepsy, Cranleigh C of E primary School, Cranleigh CAB, and Shooting Star Chase. In addition, awards were made from the 2018 Bursary fund to: St Joseph’s School, the Cranleigh Swimming Club, Ewhurst Stoolball Club, Ewhurst Infants school, Jigsaw trust, Phyllis Tuckwell, Wonersh Scouts and Riding for the Disabled. During the evening, presentations were made on the work of the GASP Motor Project, The Meath Epilepsy Charity, and Lions International. Lion President Derek Trawber, thanked all the charities for the fantastic work that they do in helping and supporting the local community. Sign up to receive news from the Cranleigh Lions including our events, opportunities for supporting us and about the work we do.